There are many things that one must consider during the design and construction of a new custom home. It is very difficult for any one person to know all of the questions to ask, let alone whom to ask, or what the answer should be. It is particularly difficult for homeowners building their first custom home to be able to anticipate all of the possible choices or decisions that they will be asked to consider. Even if your architect, designer, and/or builder know the right questions to ask and are able to provide you with competent guidance, it is unrealistic for you to expect the professionals with whom you are working to be able to anticipate all of your wants and needs. They simply are not able to read your mind or teach you every single thing that they have learned over the years about home building. It will still be your responsibility to learn as much as possible about the options available to you so that your new home will be everything that you want it to be. 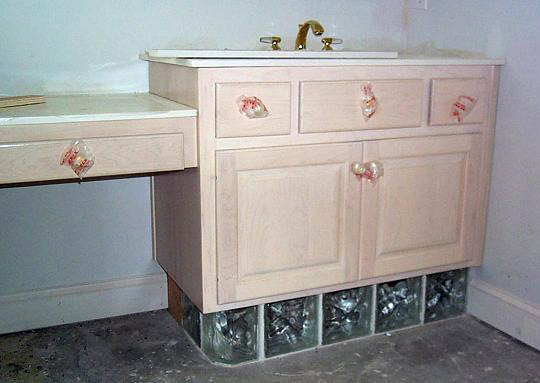 Bathroom vanities are an example of a very common group of items, used in almost every new house, that are often taken for granted. Homeowners are typically shown an assortment of sample cabinet door panels and asked to make a decision based almost entirely on the door style or type of finish. Then they are shown a series of small cultured marble countertop pieces glued to a cardboard display panel and politely asked which countertop they would like to use in their bathrooms. The homeowners make their decisions, the builder orders the cabinets and countertops, and the trim carpenters install them in your new bathroom shortly after they are delivered. However, as you were making your selections a few months ago did you ever think about how tall — or short — your bathroom vanities would be? Most bathroom vanity cabinets are only about 29 inches tall, and most cultured marble vanity tops are about 1 inch thick. So, the finished height of your bath countertop is normally about 30 inches above the finished floor — the same height as your kitchen table. I realize that people come in all different shapes and sizes, but how many times have you stood up next to your kitchen table to eat dinner or sat in a chair to wash your face and brush your teeth? As far as I am concerned, with the exception of small children or those confined to a wheelchair, a 30 inch high bathroom countertop is simply too short for most people to use comfortably — a point of which I am too often reminded. One solution to this situation is to raise the installation height of your vanities by installing them on top of 2×4 or 2×6 blocking. This blocking can be hidden by using matching cabinet materials, wooden baseboard material, or my favorite solution; ceramic tile to match the bath flooring, which gives a built-in appearance. Another solution is shown in the picture on the left. 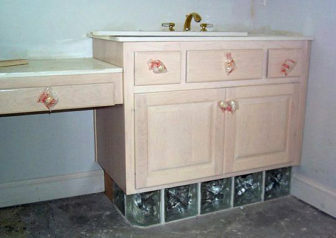 In this example the owners have removed the standard toe kick and placed the vanity cabinet on top of glass block. When this installation is complete, a small fluorescent light behind the glass block will provide a very interesting effect. Another option is to look for bath cabinets that are taller than normal. It seems that some cabinet companies have finally started to manufacture vanities that are about 33 inches tall. You may also want to consider using kitchen cabinets, which are about 34-1/2 inches high, instead of bath cabinets. When you add the thickness of the counter top material, the height of the vanity top above finished floor can be 35 or 36 inches. You will need to remember though, that vanity cabinets are usually about 18 or 20 inches deep and the countertop normally projects about an inch beyond that. Most kitchen cabinet boxes are 24 inches deep. Then you need to add the door and drawer fronts, the cabinets knobs, and the countertop overhang. In many cases, this difference in depth may cause a problem with the layout of smaller bathrooms. You will also need to be sure to notify your electrician if you plan to raise the height of your cabinets since light switches and receptacles may also be affected. So, be sure to double check the dimensions of your bathroom and your bathroom cabinets. 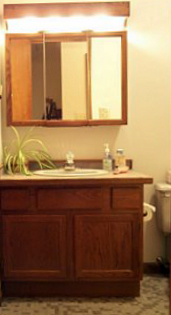 Then consider the option of raising your bathroom vanities to a more comfortable height B4 U BUILD.